This activity is connected to CCGPS ELACCKW1: Use a combination of drawing, dictating, and writing to compose opinion pieces in which they tell a reader the topic or the name of the book they are "writing" about and state an opinion or preference about the topic or book. 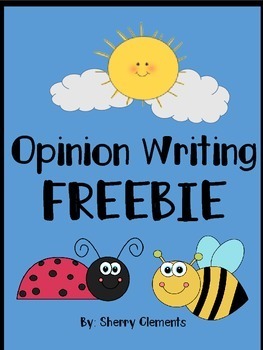 The topic for this opinion writing FREEBIE is "insects (bees or ladybugs)." These opinion writing activities are great to put in a writing center for students to choose which pictures to use to give their opinions about or for a mini lesson on opinion writing. This FREEBIE includes one page with picture choices of insects (bees or ladybugs). The page says “Which insect do you like better? Why?” then it has five blank lines for students to write on to tell why they think their choice is the best. Students love telling which item they like better. This activity encourages students to give the reason why they think their choice is better. Teachers can also use these writing activities as a whole class activity. Assigning these activities for a homework assignment can include parents in helping increase their child’s writing skills. However you choose to use these activities, I hope your students develop a love for writing. Please leave me some feedback!